Now this one was a bit different from the JA books I usually read, and that is always something I approve of. I do like change. This book is all about Colonel Fitzwilliam and the lady he loves (yes yes we can all figure it is Anne), Colonel Brandon and Marianne, and Colonel Buford who falls for Caroline. Really Caroline?! That was my first thought, but if Darcy can change then so can Caroline and she does change. She actually becomes a really sweet person and I liked her. Which I never thought would happen. I felt that the book was mostly about Buford and Caroline, then came Fitz and Anne and last the Brandons. But then these two were settled and happy so no drama there. While there sure was drama around Anne and Richard. And of course the romance of Buford and Caroline. What was also fun was that everyone knew each other. Lizzy was friend with the Marianne and Elinor. There is a mention of Tilney and the Elliott family and I do love that. Like they all were there and could have met. As for the story there was romance, drama and then last, Waterloo. I liked to see all the characters I love and to see new people find happiness and to hear what happened to others. One thing though, something happened that I did not like one bit, I am still a bit upset, sadly I can't say what. Then again another thing also happened which made me really glad so I guess those two things take themselves out. And there was also a love scene that felt a bit awkward. But I have never been one for details. All in all a fun Jane Austen variation. Though even if not a colonel, I still missed Wenthworth, he is a fighting man after all. If you want more than just Lizzy and Darcy then this might be JA variation for you. Jane Austen's fighting men sure needs love too. I don't understand the draw of Jane Austen and never have. If this would read as a stand alone it might be interesting, though. It does sound like a fun read! I'll be reading this soon, and I can't wait. I think I'm going to like it a lot! Caroline is gonna surprise you! I always have trouble with Jane Austen spin off books, but your review has me wanting to try this! I have this one as well, I can't wait to read it! Glad you enjoyed it :) Too bad Wenthworth wasnt in it, now you've got me wondering what happens that you didnt' like. I kind of like it when they concentrate more on the other characters once in a while. Sounds like a great one to add to my Austin variation list! *looks around* No flash this week? I just started this one. Glad you enjoyed it. I love,love, love Jane Austen.so i am grabbing this one...thanks for sharing. Nice review! I did like all of Jane Austen's characters except Caroline so maybe reading this will change my opinion of her. Oh I hate Caroline, but here, I mean she befriends Mary! And likes her..
Mhmmmm, you caught my attention with this one. I did have a fainting thought like that while reading another book that mentioned the battle of Waterloo. I wonder if some of the military men in Austen's books would have done if they were there. Interesting. I'll have to check this out. ^.^ Thanks for finding this! BTW...Caroline...liking her? Oh my. I am a little shocked. I wasn't sure I'd like this one so I didn't request it but I'm really glad to hear it was a fun read for you. Maybe I'll pick it up someday. Nice review, and it sure sounds like fun to have them all meet each other. I do wonder what those authors would write had they not found Jane Austen's books though. Would they have any inspiration at all? You know, I think they would have had something to write about too. P n P left so many of us wanting more. It is such an excellent book and had so much to explore. These fine authors used their talent, their love of Jane Austen and their desire to add to the original and by doing so,give us that more we were missing! I wish I could do that but just don't have the talent. I am very thankful for those that do! i am reading this now! i loved pemberley ranch. Author Jack Caldwell here. Thanks for all the great comments and the wonderful review! Aurian - The story I wanted to tell is there on the pages. Using Austen's characters can be a shorthand way of writing what I'm trying to get across. 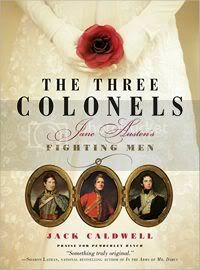 In THE THREE COLONELS, it's all about the heroes who wear the uniform, and the loved ones left behind back home. If we didn't use Austen, we would have just made up new names. Writing is a disease (LOL!) -- we Have to do it. Thank you for your reply Jack, I do wish you good luck with the book, and I know there are many Jane Austen fans out there who will love it.